There are a host of theories as to why the appeal of zombie fiction continues to grow. Whatever the underlying psychological implications, we have high hopes for the CW’s new show iZombie, beginning on March 17. Gwen, Spot the were-terrier, and Amon the mummy. 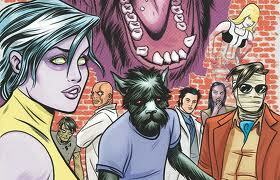 iZOMBIE (Roberson/Allred). The show seems only very loosely based on the comic, however. The protagonist of the comic, Gwen Dylan, is a revenant who works as a gravedigger. 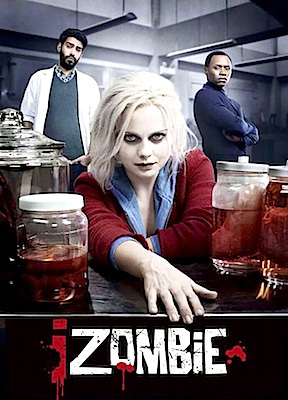 In the show, she is Liv (a zombie named “Liv”— ahaha) Moore (Rose McIver), a med student/assistant mortician. From there, it only deviates more: there appears to be no mention of her ghost best friend, her brother, or their weredog friend Spot/Scott. It also looks like the show will be set in Seattle instead of Eugene—an important distinction for fans of the comic’s frequent use of Oregon landmarks and locations. (Although perhaps not surprising—Roberson and Allred of the comic are from Oregon; Thomas of the TV show grew up in Washington State.) Additionally, the show will be a police procedural—not our favorite format, but we have hope that Rob Thomas will help provide the edgy fun he brought to Veronica Mars. Monsters dressed up as themselves for Halloween—meta-monsters! Ellie, Gwen and Spot, iZOMBIE (Boberson/Allred). The series premiere on the CW is Tuesday, March 17 (St. Patrick’s Day) at 9pm—Supernatural‘s old time slot (The Winchesters will be moving to 9pm Wednesdays beginning the following night). it’s hard to tell which side of the spectrum between Buffy the Vampire Slayer and The Ghost Whisperer this show will fall toward, but we’ll be watching to find out.